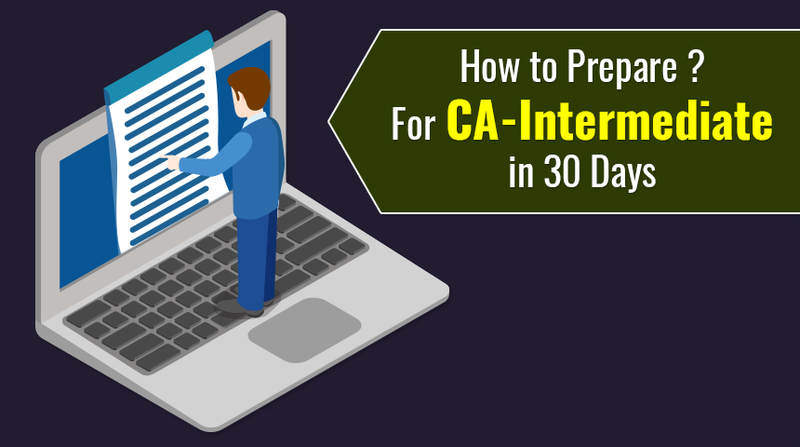 How to Prepare For CA-Intermediate in 30 Days? CA-Intermediate exams are just around the corner. With just 30 days in hand, now is the time to push your limits and gear up for the upcoming exams. As you may already know, it is not easy to clear both groups in 30 days. So, if you are appearing for two groups together, you need to double up your efforts. But before you can truly begin, you must fight a slightly more difficult battle against that small voice in your head which says, ‘no, you can’t do it’. Once you have conquered your fear and self-doubt, conquering the CA-Intermediate exams will not seem to be such a daunting task. Especially when you have our CA experts to guide you with the most effective preparation tips for CA-Intermediate, you will have precious little to worry about. The final month before CA-Intermediate exams is also the final phase of your learning. Our experts term this phase as the ‘Revision Phase II’. The learning phase begins months before the exam, and is closely followed by the first round of revision. So, ideally, 30 days before the CA-Intermediate exam you should be doing your second round of revision. These 30 days are extremely vital. How you prepare yourself in these 30 days will largely determine your chances of succeeding. As per the new syllabus, the CA-Intermediate exam is conducted on 8 subjects, divided in 2 groups. Group I has 3 practical papers: Accounting, Cost and Management Accounting and Taxation, and 1 theory paper: Corporate Law and Other Laws. In the case of group II, there are 2 practical papers: Advanced Accounting and Financial Management and Economics for Finance, and two theory papers: Auditing and Assurance and Enterprise Information Systems and Strategic Management. Phase 2: 6 days These days are to be kept aside for RTPs, Practice Manuals and Mock Test Papers. **Students must solve at least one mock test paper for every subject. ***The study planner is not curved out in stone, students can to adjust it according to them. Do smart revision: Being in sync with the study planner given above will ensure that you can revise the whole syllabus effectively before the exam. To smarten up your revision process you can further break it down to daily and weekly revision bytes. Every day, for the next 30 days you can glance through whatever topics you have revised throughout the day. Similarly, you can set aside few hours in the last day of the week, to revisit every topic you have revised throughout the day. Begin with the easy: When you begin by revising the easier part of the syllabus, you can cover more in less time. This helps to boost your confidence and keep your fear at bay. By the time you come to the not-so-easy bits of the syllabus, you are already done with the major part of the syllabus. You can now set aside the remaining time dedicatedly to the more difficult subjects or topics. Stay focused while revising: Do not revise directly from the book. You may get tempted to read new topics just one month before the exams. This will prove to be counter-productive to your preparations for CA-Intermediate. Stick to your concept registers and revision notes. The last month before the exam is about really knowing what you already know from the syllabus so that you can write perfect answers in the exam. The study planner along with the pointers above will help you to effectively prepare for CA-Intermediate in the last 30 days provided that you do not panic or undergo a nervous breakdown right before the exam. Hence, it is important to take small breaks and come back fresh every time your brain is going numb. Also, remember to eat your meals on time and take good care of your health. The last thing you’d want is to fall sick just 30 days before your exam. How to Prepare for CA Intermediate Group 1 in 30 Days? How to Prepare for CA Intermediate Group 2 in 30 Days?